Held in August or September each year, depending on the position of the moon, the very popular Ganesh Chaturthi festival celebrates the birth of beloved Hindu elephant-headed god, Lord Ganesh. Ganesha, also fondly referred to as Ganpati, is popularly worshiped for his ability to remove obstacles and bring good fortune. The festival begins with the installation of huge elaborately crafted statutes of Ganesha in homes and canopied podiums (called pandals), which have been specially constructed and beautifully decorated. Artisans put months of effort into making the statues. The statues are then worshiped for various durations of up to 12 days, before being immersed in water. 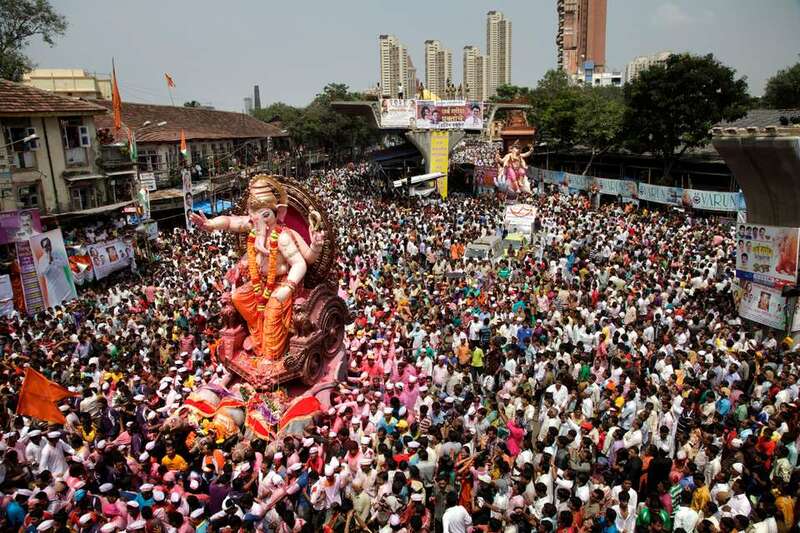 Mumbai is one of the best places to experience the Ganesh Chaturthi festival. Around 10,000 statues of Lord Ganesh are displayed at various locations in the city, and the procession of statues for immersion on the final day is massive. It's guaranteed to be one of the most extraordinary experiences you'll ever have! Other Indian states that also widely celebrate the festival include Goa, Tamil Nadu, Karnataka, and Andhra Pradesh. Scroll through this photo gallery to see how the festival is celebrated. Continue to 2 of 46 below. The labor-intensive process of handcrafting idols of Lord Ganesh gets underway about three months before the start of the festival. It takes place in roadside workshops that pop up under blue tarpaulins, as well as in larger dedicated spaces. If you're interested in the process, it's possible to see the statues being crafted. Continue to 3 of 46 below. The idols of Lord Ganesh are mostly crafted out of plaster of Paris, although growing awareness about the environment is leading to more eco-friendly clay idols. The large idols are so big that they require scaffolding to be erected! Continue to 4 of 46 below. Painting the idols and bringing them to life is a delicate and time-consuming process. Great care is taken during the decorating process. These Ganesh idols are being produced by Gulbai Tekra, the single largest supplier of Ganesh idols in Ahmedabad in Gujarat. It's estimated to have about 1,200 idol makers. Continue to 6 of 46 below. As the start of the festival approaches, numerous roadside stalls appear selling a wide variety of idols. Continue to 7 of 46 below. These small Ganesh idols with be purchased by people for installation and worship in their homes. Continue to 8 of 46 below. The Ganesh idols are decorated with flowers and other holy items when installed. Families who have installed Lord Ganesh in their homes worship him at various times during the day and treat him as a beloved guest for the duration of his stay. Continue to 10 of 46 below. Large Ganesh idols are transported by truck and installed on decorated podiums (pandals) that the public can visit. Hindu priests prepare the idol of Lord Ganesh during the installation process and get it ready for worship. Continue to 11 of 46 below. These displays can be found on roadsides and at the end of streets all over the city during the Ganesh Chaturthi festival. Continue to 12 of 46 below. Many are funded by local neighborhood communities who all get together to worship the idol. The pandals are so peaceful and inviting, it's easy to forget the traffic and noise outside! Continue to 14 of 46 below. Plus, it's exciting to see all the different designs of the idols. Continue to 15 of 46 below. Unfortunately, most Ganesh idols are not eco-friendly. They're made from Plaster of Paris. However, the concept of biodegradable clay idols is catching on. This 12-foot one near Bangalore is a great example. Continue to 16 of 46 below. Mumbai is known for its huge and lavish displays of Lord Ganesh, with unique themes each year. The most popular one is the Lalbaugcha Raja. Discover 5 Famous Mumbai Ganesh Mandals. Many apartment complexes also install an idol for residents to worship. Continue to 18 of 46 below. A gray mouse stands to the right of the statue. The mouse is known as Lord Ganesh's vehicle, which carries him around. The fact that he rides on such a small creature signifies the unity of the small with the large. The mouse, being such a small and agile creature, is also able to find it's way unobstructed through the narrowest of spaces. Continue to 19 of 46 below. At set times of the day Hindu priests perform an aarti ceremony (worship with fire), which the public can attend and participate in. Continue to 20 of 46 below. 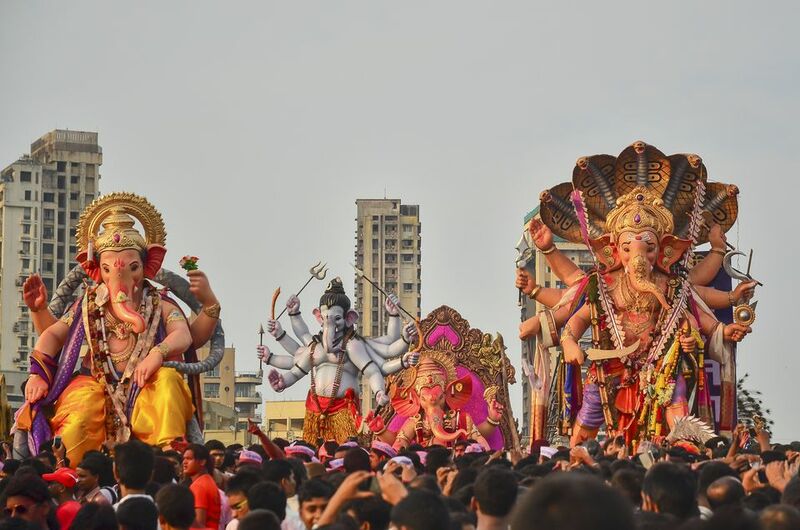 On the last day of the festival, the statues of Ganesh are taken down from their podiums, loaded onto the back of trucks, and paraded through the streets towards the ocean or other water bodies in energetic processions. This culminates in the statues being immersed in the water, in a ritual called visarjan. The processions through the streets are accompanied by a lot of loud drumming to farewell the Lord. Continue to 22 of 46 below. There's also exuberant dancing in the street as the statues of Lord Ganesh make their way to be immersed. Continue to 23 of 46 below. The processions to farewell Lord Ganesh usually continue through the night. Even the last of the monsoon rain doesn't dampen anyone's enthusiasm. Continue to 24 of 46 below. The Lalbaugcha Raja has numerous attendants to look after him as he goes on his journey to the ocean to be immersed. The immersion procession for the hugely popular Lalbaugcha Raja in Mumbai sees the streets filled with devotees. Some even get prime position on the roofs of buildings. Continue to 26 of 46 below. The idols follow set routes as they are take in procession for immersion. Continue to 27 of 46 below. It's best to stay in one spot and watch the idols as they pass by. Continue to 28 of 46 below. Some of the designs are quite unusual, such as this owl one. People also carry the idols on their heads. Continue to 30 of 46 below. Continue to 31 of 46 below. Lord Ganesh may also get to go for a ride in a car to be immersed, especially if families are traveling from a longer distance. Continue to 32 of 46 below. In rural areas of India, you may even see Lord Ganesh being transported on bullock carts. It's a very upbeat occasion and everyone is in good spirits, despite having to bid farewell to their beloved Lord Ganesh. Continue to 34 of 46 below. You'll see many people covered in red kumkum powder, as it's considered to be auspicious (and fun) to throw it. Continue to 35 of 46 below. The festival usually takes place in September, towards the end of the monsoon season in India. Sometimes, it rains. However, it doesn't dampen people's enthusiasm! Continue to 36 of 46 below. The gorgeous idols of Lord Ganesh have floral garlands placed around them as offerings. The arrival of towering Ganesh idols at Girgaum Chowpatty on Marine Drive in Mumbai is spectacular to watch, particular against the sunset cityscape. Read more about Ganesh Visaran (Immersion) in Mumbai. Continue to 38 of 46 below. The immersion process for large idols is highly coordinated and they must wait on the foreshore for their turn. Continue to 39 of 46 below. There are so many large idols that the immersion process is lengthy and goes on all night, finally concluding the next morning. Continue to 40 of 46 below. Small Ganesh idols are carried on trolleys to be immersed in the sea at Girgaum Chowpatty in Mumbai. A young man whispers one last prayer to Lord Ganesh before finally saying goodbye. Continue to 42 of 46 below. The small idols of Lord Ganesh are easily carried into the water. Continue to 43 of 46 below. Some larger idols are carried out on pontoons. Continue to 44 of 46 below. It's a team effort to ensure that Lord Ganesh is carefully immersed in the water. Some Ganesh idols are quietly immersed alone. Continue to 46 of 46 below. Instead of naturally dissolving in the ocean, the broken parts of idols made from Plaster of Paris often wash ashore, which is a concern for the environment. Read more about the Ganesh festival and find out why the statues are immersed in water at the end of it.